On arrival at the airport in Papeete, capital of Tahiti, we are greeted by local musicians singing a traditional welcome and layers of heavenly-scented frangipani heaped around our necks by beautiful, happy smiley people. ‘La ora na! Welcome to Tahiti! The sun is shining, bananas, pineapples and coconuts fall from the trees and everyone is happy – even the dogs. This is despite 27% unemployment and no welfare system, continuing French colonial control, radiation in the ocean from decades of French nuclear tests and anglican, catholic and mormon preachings of hell. Paul Gauguin lived and died here, with arguably his best paintings inspired by Tahiti. Of course, none of his originals are still here, they’ve all been whisked off to the European galleries and the private collections of the uber-rich. In true hermit style, the first thing on the agenda is to find a cabin to rent – as far away from civilisation as possible. Our new friend Carlos drives us up the east coast, stopping to show us points of interest along the way. Tahiti is a surprisingly small island and the huge power of the Pacific is omnipresent. There’s just a single road that follows the coast all the way around. The interior is virtually uninhabited and inaccessible – a thick tangle of forest and steep pointy mountains swathed in mist. According to Carlos there is no dry season, just a ‘big wet’ and a ‘little wet’. The annual rainfall is 12 metres! Flowers grow abundantly. It is beautiful. On the way up the coast we stop at roadside stalls to buy fruit and vegetables. We wander around the gardens, point to what we want and the stall holder picks it – straight from the garden. Although it’s perfect growing conditions (sunshine, rain, volcanic soil, humidity), each stall only seems to grow and sell a small number of items. Why is this so I wonder? At last we arrive at the edge of the 1.5km wide isthmus that joins the big island of Tahiti to the smaller island of Tahiti iti – as far as we can get from Papeete and its population of 17,000. 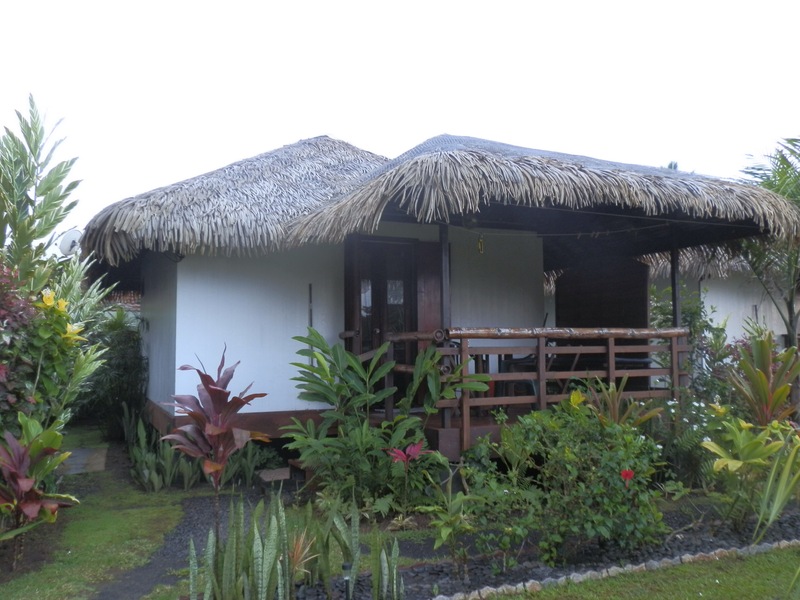 So happy to be in a sweet little palm-thatched hut on a black-sand beach with enough supplies to last us a week. Ah peace! This entry was posted in Tahiti stories. Bookmark the permalink. Oh Jeanne – I am soooo envious. Keep the blog coming in.